Upon walking in to the “Roast of Storm Roberts” excitement filled the air, and it was clear this was going to be an unforgettable event. People began arriving in their flip flops, shorts, fishing shirts, and cruise wear while soothing sounds of island music played live from the singing duo “Stir it Up”. The music drew you further into the reception where the walls of the UF Hilton were lined with silent auction items, and camera flashes lit up the room. As Storm made his appearance he was quickly adorned with a live orchid lei from a friend. The media soon flooded around him to learn more about the PALS THRIVE Program, that this event would raise money for, in his name. After a few interviews, Storm took to the stage where for a few dollars and some dancing shoes one could dance with Storm one-on-one. It wasn’t only the ladies that took to the stage either. There were a few men who weren’t afraid to cut the rug with Storm to raise a few dollars for The PALS THRIVE Program, an anti-bullying, anti-suicide, and anti-violence program in some of our schools. After the “Money Dance”, a drink or two at the bar, and a few pictures with “Selfie Storm” at the photo booth; the doors to the Century Ballroom opened to the festive Margaritaville theme brought to us by the talented event planner Keith Watson and team. The tables were lined with colorful linens, margarita glasses peppered some tables, while lanterns and festive umbrellas sat atop others. The tables were already set with a salad, as Ed Jimenez, CEO of UF Health welcomed the nearly 380 attendees. Before the Roasting began, a video explaining the PALS THRIVE Program played with students discussing the importance of the program in our schools and the positive impact it has made over the last decade. Following the video, a media frenzy took place as an inaugural Gloria Fletcher PALS THRIVE Award was presented by William Cervone, Cotton Fletcher and Cotton’s son Blake, in Gloria’s honor. The award winner, Peter Huber did a great job explaining how the program helped during his tenure at A. Quinn Jones, and how he would like to see the program implemented at his current school. Immediately following his story, Developer Cotton Fletcher donated $2,000 and Tom Cousin’s of Southeast Car Agency quickly matched it. Ed Jimenez called for the audience to match the donation again, and instantly 20+ attendees stood with their hands raised to donate $100 each. With the momentum building, the lights went down and Ed Jimenez announced the first roaster, Dr. Cherylle Hayes (Storm’s Oncologist). Whitney Houston’s “I will always love you” played in the background as Dr. Hayes was carried in by body guards, that would ensure she can speak freely. She tells multiple jokes, one referring to the pictures of the drinks he posts every Friday night on Facebook, from the Great Outdoors Restaurant saying, “Storm you clearly have a drinking problem and I’ve been meaning to talk to you about your last urine sample, it had an olive in it”. After Cherylle’s Roast, and a live auction item that was auctioned by Rod Smith, Ed Jimenez announced the next roaster, Chris Wells. Chris was a co-host with Storm for many years on KTK, they have not been together on the radio for a long time now, so her roast was more affectionate. After her roast a second live auction item was auctioned off and the next roaster Ken Block was announced. Ken Block, the lead singer of Sister Hazel, has been a friend of Storm’s for some time. He joked about Storm being spokesman for nearly every local company in Gainesville…it’s funny because it’s true! Then Rod Smith auctioned off a third live auction item, a signed “Sister Hazel” guitar, but not before Ken played it and sang a line from their “All for you” song. Next, Rod Smith was up, he finished off the Roasting like a champ. His delivery was on pointe, and the crowd love it. The last and final auction item was auctioned off, and Ed Jimenez let Storm have a final say. He of course was cordial and polite, mostly, and reminded everyone what the evening was really about. Then he handed the mic to Marina Cecchini, Administrator at UF Health Shands Psychiatric and UF Health Shands Rehab Hospitals. Marina, who sits on the PALS Advisory Board and was on the Roast Committee gave recognition to Carol Bosshardt, who parented the idea of the Roast, designated the committee, and made it all happen. 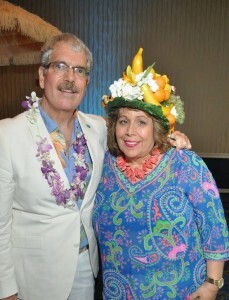 Marina adorned Carol with a ‘Carmen Miranda’ style fruit hat, that only seemed appropraite for the evenings theme. The greatest part of the whole evenings event was seeing the Gainesville business community come together to support this great program which continues to make a huge difference in the lives of many teenagers in our town. If it wasn’t for these businesses, and their generous support, the PALS THRIVE Program could not exist.